The hinges, lock and hasp used for the lid of Ruckers harpsichords are very characteristic of their instruments and of other objects of furniture made in Antwerp in the same period. They are made from solid brass sheet which is cut out and bent around the axles of the hinges and hasps. 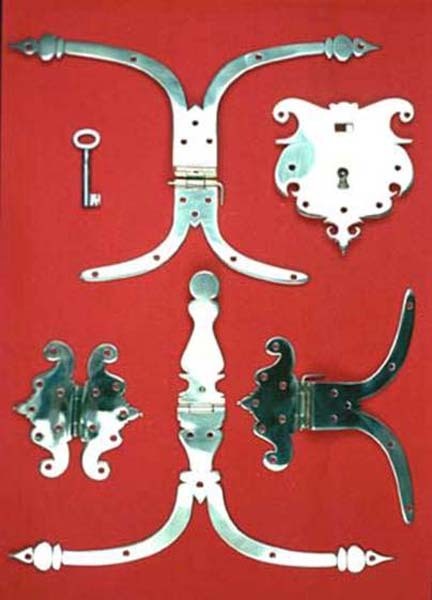 The lock has a brass front but the mechanism behind the escutcheon is mostly of iron, the most important part being the work-hardened iron spring that traps the hook of the hasp and that is released by turning the key. The flap on the hasp is spring loaded so that it pops open when the key is turned. The hinges, hasp and lock are all held in place using short brass escutcheon pins driven into the wood of the case, lid and front fall board. All of the hardware for this instrument was made by Grant O’Brien.